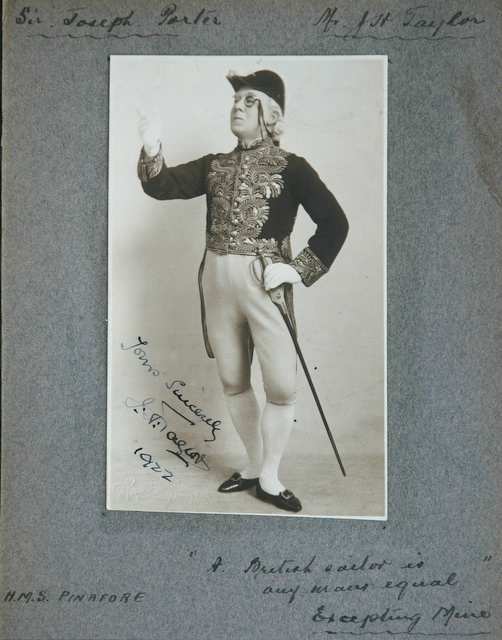 George Cook (1883 - 1968) was an enthusiatic Savoyard and, by all accounts, had a fine tenor voice and was an accomplished actor. Portraits of him in a variety of operatic leading roles have graced the walls of our family homes for many years. 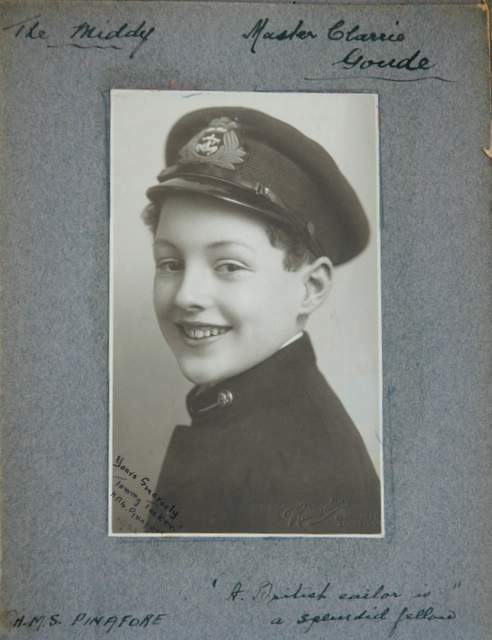 His love of the works of Gilbert and Sullivan (perhaps kindled in the early twentieth century when WS Gilbert was still alive) has filtered down through three successive generations. 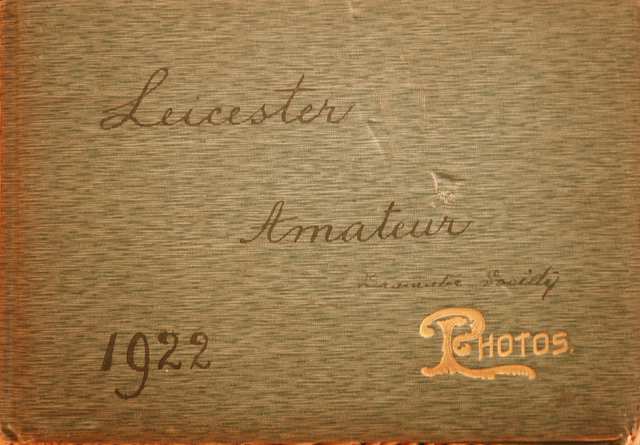 We recently discovered a photograph album which he put together and annotated of the series of performances by the Leicester Amateur Dramatic Society (of which he was a member) at the Royal Opera House, Leicester in March 1922. 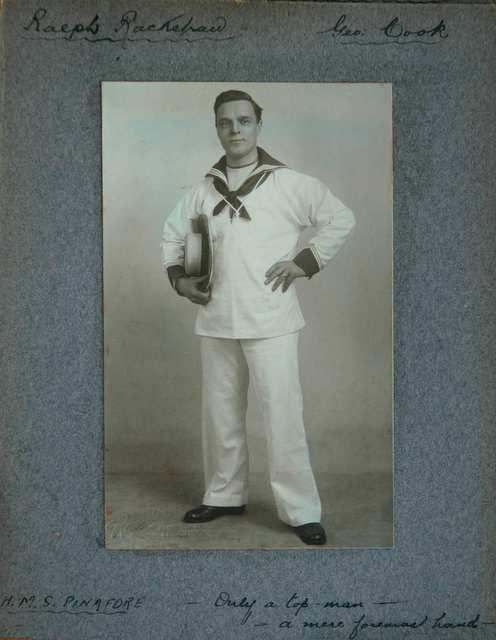 Each evening consisted of "HMS Pinafore" in which he played the lead tenor Ralph Rackstraw and "Trial By Jury". 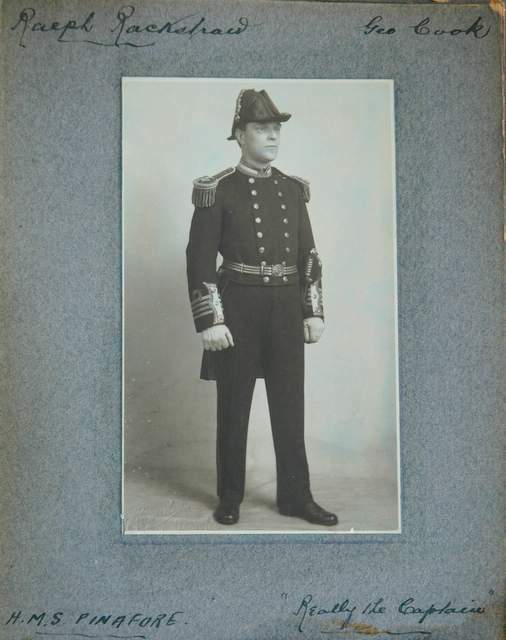 Photographs of "HMS Pinafore" are shown on this page; the remaining images can be found at A photograph album of "Trial By Jury". An illustration of the facade of the Royal Opera House can be found on the HMS Pinafore / Trial By Jury 1922 Programme page. 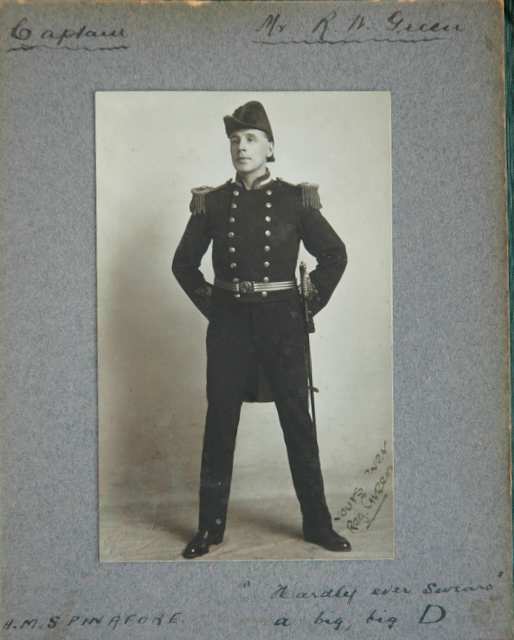 "Only a top-man; a mere foremast hand"
"A British sailor is any man's equal excepting mine!" "Hardly ever swears a big big 'D'!" "Come of your Buttercup buy"
"My name's agin me, but I ain't as bad as I seem"
"I'm shocked. 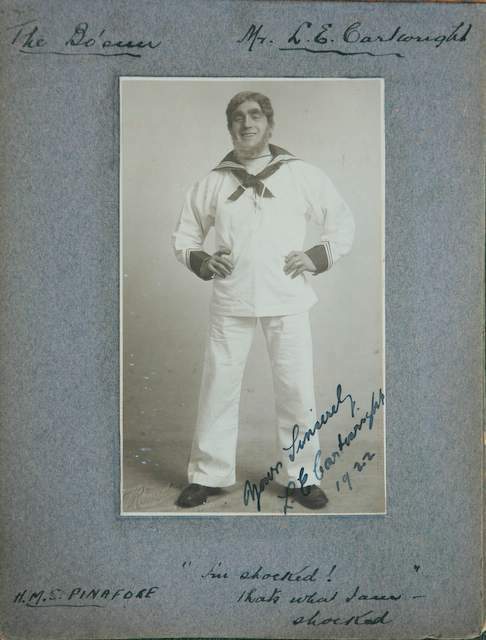 That's what I am - shocked"
"A British sailor is a splendid fellow"
"All sailors should dance hornpipes"
"A performance of a Gilbert and Sullivan opera by the Leicester Amateurs is as welcome as the flowers in May. The freshness, the enthusiasm and the all-round excellence of the representations are like a tonic after feeble and familiar revues and some of the uninspired muscial plays given by jaded and not always clever professionals. 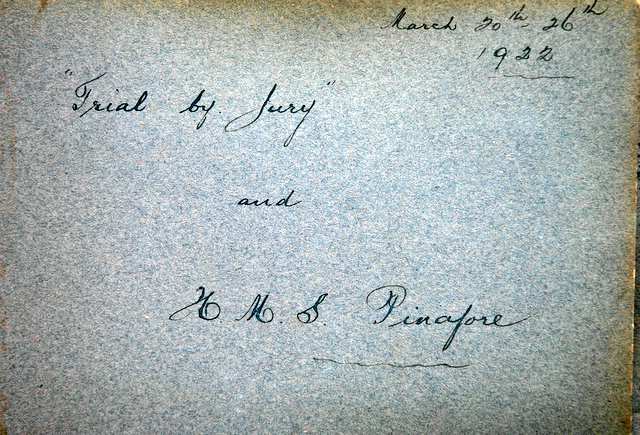 I thoroughly enjoyed the performances of 'Trial By Jury' and 'H.M.S. Pinafore' at the Opera House this week. I shall not attempt to go into critical detail for the simple reason that there was so much that was good that it is not necessary to quibble about minor defects. 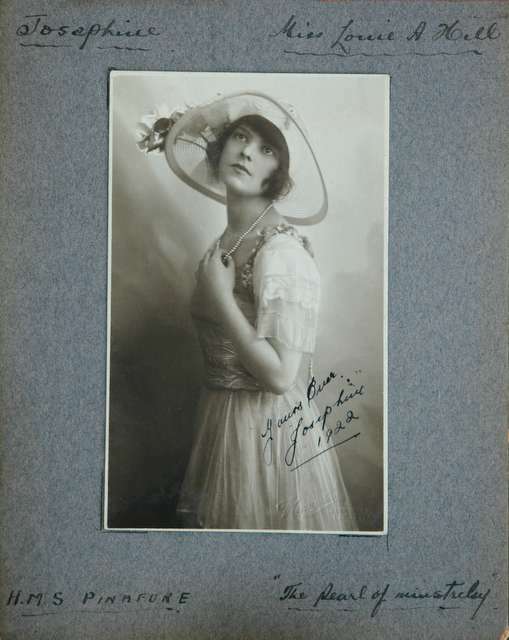 The work of the chorus, as usual, was of the best, the staging and the stage management left nothing to be desired - in this respect the permanent staff are entitled to share the honours - and both operas showed that great care had been devoted to their production. Generally speaking the principals did well. 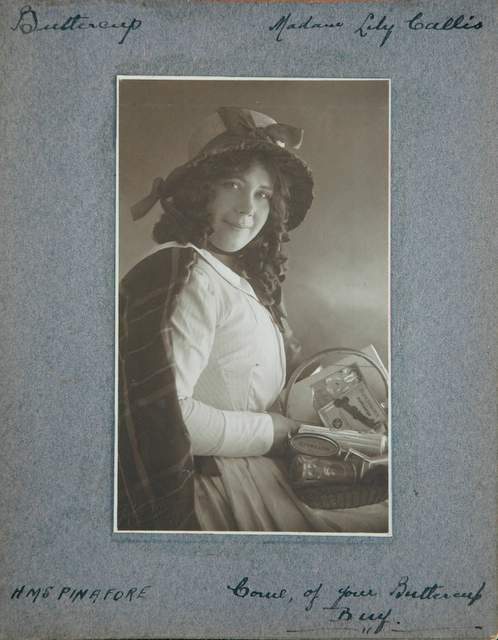 In Mr. George Cook, who appeared as Ralph Rackstraw, the Amateurs have a valuable acquisition. He has a tenor voice of pleasing quality and shows a decided aptitude for acting. 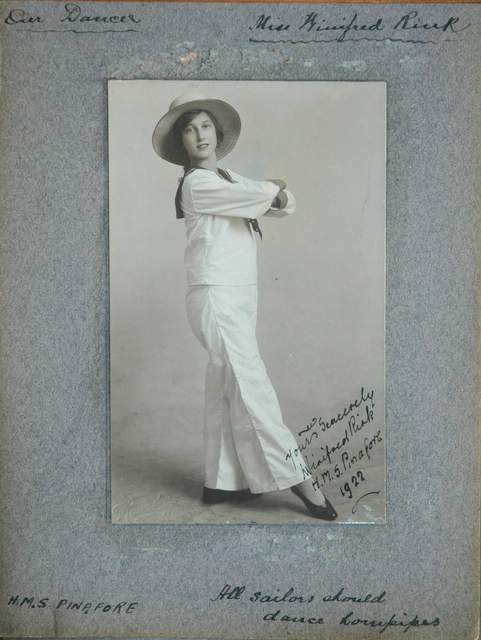 The little lady - Miss Winifred Rink - who danced the hornpipe in 'H.M.S. Pinafore' was really delightful. She danced with a lightness and grace that is as rare as it is satisfying. 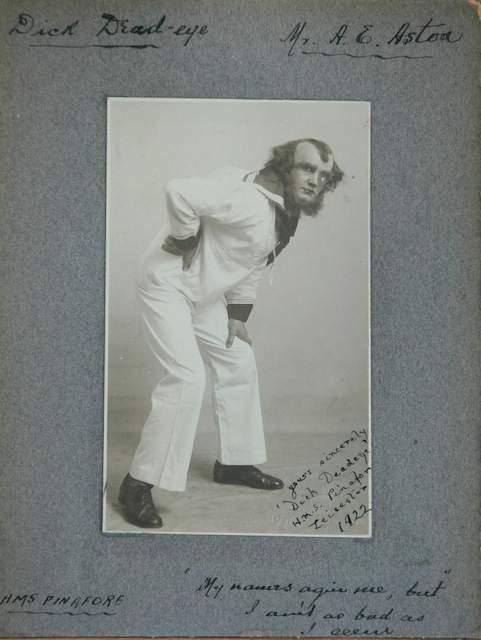 Then there was Master Clarrie Goude, who moved about as a midshipman as if to the manner born. I also liked Mr. A.B. Talbot's judge. If he has done anything better it was his King Gama in 'Patience'." George Cook's comment on this press accolade was: "My hat!!! Gee Whiz!!!" 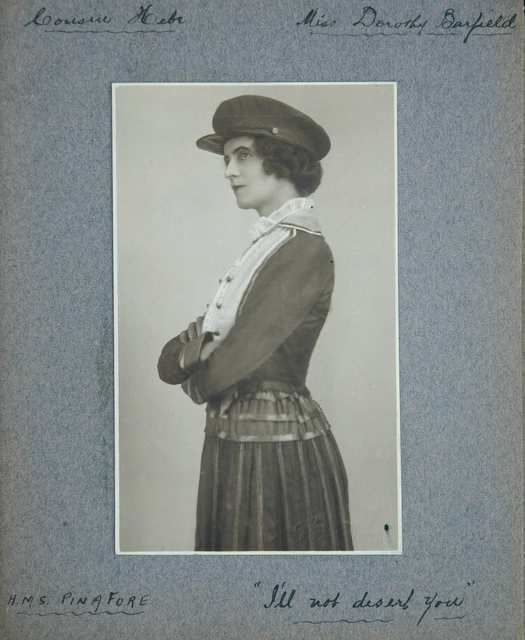 Our thanks go to David Lovell, a G&S performer and collector from Leicester who discovered a copy of the programme for this performance. 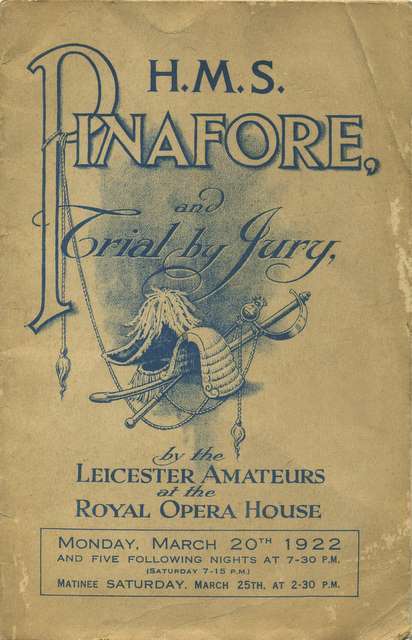 We have reproduced this here: 'HMS Pinafore' / 'Trial By Jury' programme.